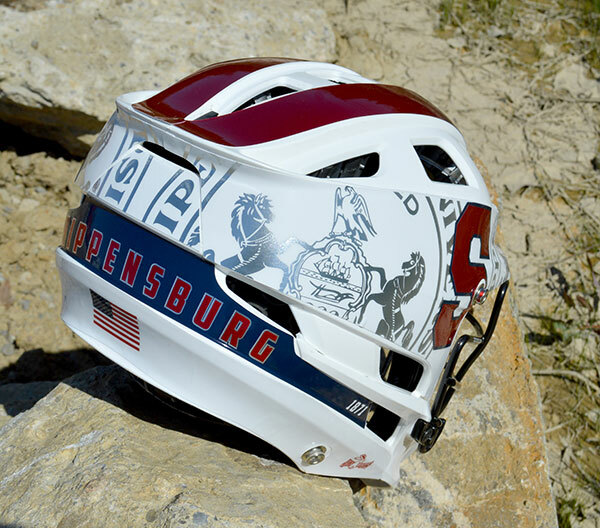 One of our favorite all-time lacrosse helmet wrap designs goes to Shippensburg University’s Men’s Club Lacrosse Team. We have had the pleasure of working with the Raiders of Shippensburg since 2015. Over the years, we have received many compliments and interest from customers who have seen this design in our photo gallery. Here is a quick rundown of this popular design. When initially discussing the project with Shippensburg, it was clear they were looking for a clean design. Our challenge was to incorporate all the elements they wanted to include such as their school crest, block “S” logo, and an American Flag while still keeping the clean look desired. A restrained use of color was the key to making the design work. The primary color used for Shippensburg’s wraps is white, matching their helmets. Then pops of chrome, chrome red, and navy are added in key areas for impact. Starting with the side panels, the large block “S” logos can’t be missed in a bright chrome red outlined in navy. Throughout the rest of the side panels are overblown portions of Shippensburg University’s school crest. The crest is printed in a subtle chrome, and due to the oversized nature, acts almost like a background pattern or texture adding visual interest. 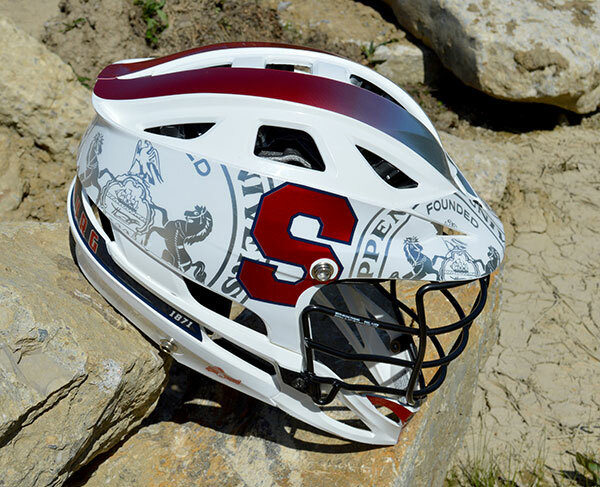 Other pops of color appear on the chin decal and mohawk stripes. The chin is bright red, while the top stripes fade from chrome to metallic red. 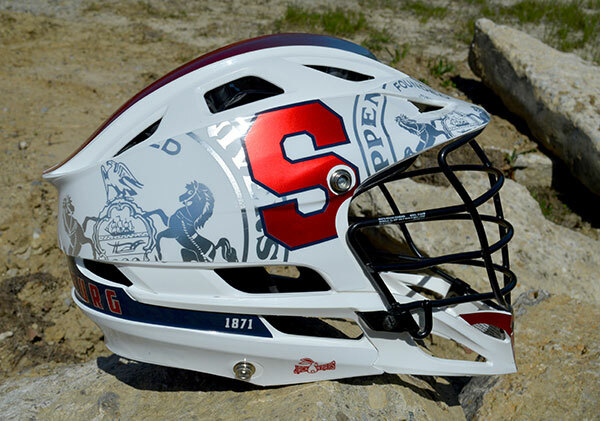 The back-panel decal is printed using a contrasting navy with chrome red “SHIPPENSBURG” type across the entire back of the helmet. The outer edges of this back panel feature the date “1871” honoring the year the cornerstone was laid for the University. To finish off the design, an American flag is included. 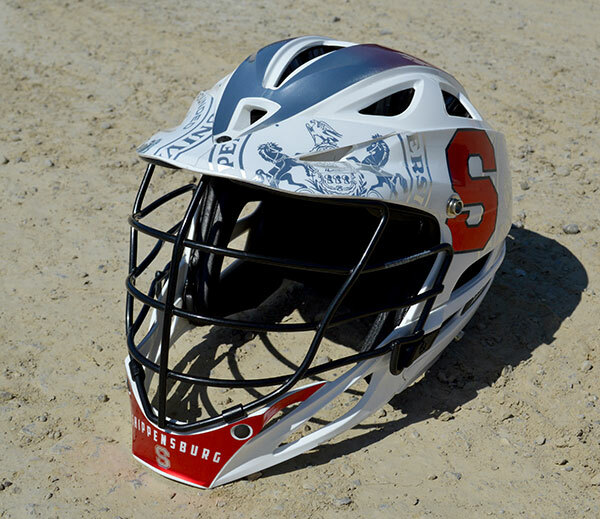 Are you interested in a new look for your team? Reach out today to speak with one of our reps. We’re ready to get started on a free proof and quote for your program.